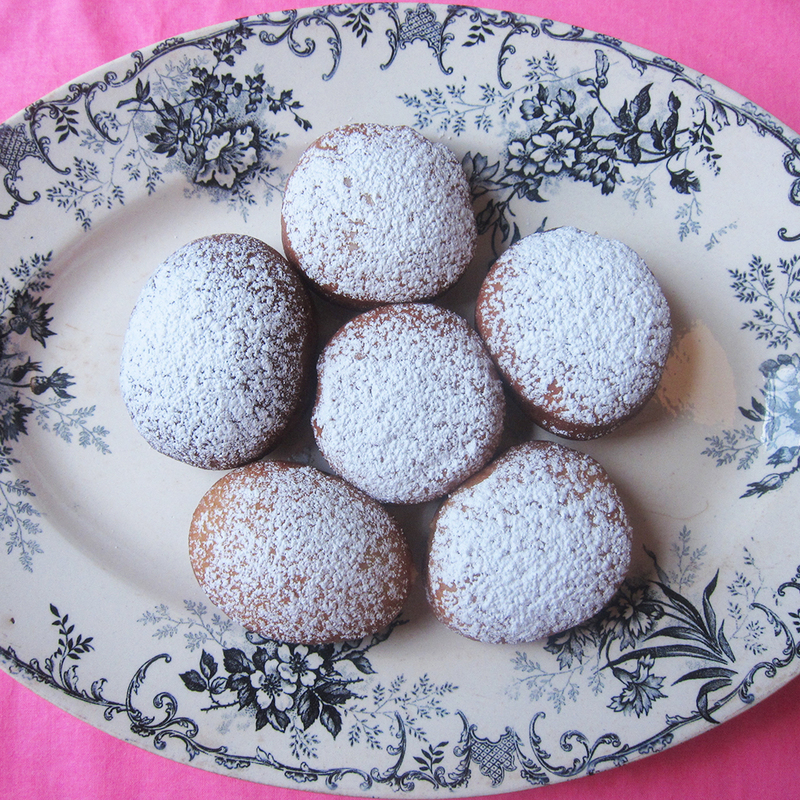 Inspired by the red-fruit beignets I gorged on while in Paris this spring, I recently started fiddling around with beignet recipes while listening to the latest Arcade Fire record, Reflektor. A hypnotic piece of music produced by LCD Soundsystem’s James Murphy, it has that disco dance flair that Murphy’s DFA record label defined in the early 2000s. I know you all remember the disco-punk sounds of The Rapture (RIP). A standout track on the record is “Joan of Arc.” She was just 19 when sent to perish in the flames. Joan was burned at the stake in Normandy, which happens to be a major producer of apple brandy, Calvados, a superb and classic pairing with apples, naturally. This is dark, I know, but since Joan’s body was ignited by fire I thought it best to flambé my apples before pureeing. There’s nothing like a little bit of pyrotechnics to get things going in the kitchen! The caramelization of the sugar and the kick from the Calvados deepen the flavor of the apple filling, while the crisp composition of a fried yeasted dough creates the optimal exterior for a silky center. In a medium bowl, stir together the yeast and water. Set aside to proof. After 10 to 15 minutes, stir in the all-purpose flour, cover with plastic wrap and set aside in a warm place until the dough doubles in size. In the bowl of an electric mixer, use the paddle attachment to cream together the butter and sugar until it pales in color and gets fluffy. On low speed, add the eggs, one at a time. When the eggs have been fully incorporated, add the vanilla and salt. Add the bread flour and mix on low speed until fully combined. Remove the paddle attachment, and use the dough hook attachment to mix at medium-to-high speed until the dough comes together in a ball. Add the yeast mixture and stir until fully incorporated. Place the dough in a lightly oiled bowl, cover with plastic wrap and proof for 1.5 hours. Meanwhile, make your apple puree: Peel, core and halve each apple. Cut each half into five wedges. In a sauté pan, add the butter and melt over medium heat. Place the apples in the hot pan and move the apples continuously until they are brown on both sides. Coat the apples with 75 grams of sugar, allowing the sugar to caramelize. Flambé the apples with the Calvados and cook for a couple of minutes to burn off the taste of alcohol. Immediately transfer the apples to a food processor. Add the ¼ cup of room temperature water and the cinnamon. Process until smooth. Let cool and then transfer the mixture to a pastry bag fitted with a smaller-size round tip. Set aside. Lightly flour your rolling surface and roll the dough out to a 1-inch thickness. Cut rounds of dough with an average-size biscuit cutter and place them onto a floured baking sheet to rest for 30 minutes before frying. Line a sheet pan with paper towels. In a large pot, heat the oil to 365˚ (use a candy thermometer). Place the beignets in the oil and cook until golden brown on both sides. These brown quickly, so be sure to watch them closely. Remove the beignets with a slotted spoon and place on the paper towel-lined sheet pan. Let the beignets cool a bit, and then fill with the apple puree by poking the side of each beignet with the tip of the pastry bag and squeezing. The Kitchen Party series is a spin-off of my blog, In the Kitchen at Parties, where I combine my two loves, music and baking.